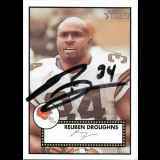 Reuben Droughns is a retired American football running back who is currently the assistant coach for the Serbian team Vukovi Beograd, the two-time champions of the Central European Football League. He was drafted by the Detroit Lions in the third round of the 2000 NFL Draft. He played college football at Oregon. Droughns has also been a member of the Miami Dolphins, Denver Broncos, Cleveland Browns and New York Giants of the National Football League. He earned a Super Bowl ring with the Giants in Super Bowl XLII. New Response (Success): sent card, index card and sase - signed my card. T..